Peanut butter lovers everywhere are going to gang up on me when I tell that I simply don’t like the taste of peanut butter. Just like “love at first sight”, it was “hate at first taste” for me. I love to snack on actual peanuts but a big no for peanut butter. I don’t know if it is the taste or the smell or its characteristic to stick to the roof of your mouth making it so uncomfortable. I had some left over peanut butter which was going to expire. 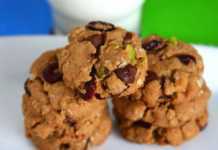 When looking for recipes using peanut butter I found an almond butter chocolate chip cookie recipe in the book “One Smart Cookie”. I borrowed this book from the library ages ago and had taken a copy of that because unlike peanut butter I absolutely love almond butter. Anyways I decided to substitute peanut butter for the almond butter because we all know that peanut butter and chocolate is a very good combination. 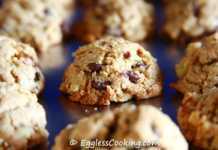 I also used some cake flour instead of the all purpose flour mentioned in the recipe and the cookies turned out great. It was crisp around the edges and soft in the middle. These chocolate chip peanut butter cookies had an interesting and different texture than the cookies I have baked so far. I think it is because of the cake flour. I too liked the cookies. The flavor of peanut butter did not put me off. That with the combination of the chocolate chips gave it a very nice taste. 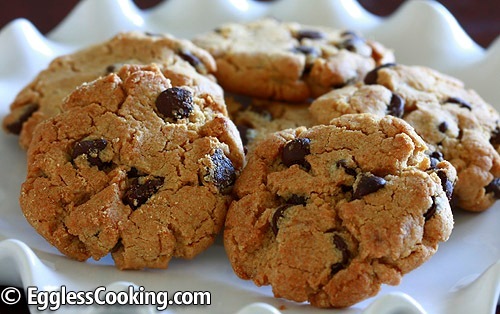 Easy to bake and very yummy peanut butter chocolate chip cookies made using Ener-G egg replacer powder. Preheat oven to 350F/180C for 15 minutes. Do not grease the baking sheets. In a small blender, blend together the Ener-G powder and warm water until its frothy. Keep it aside. I use the small jar of my Magic Bullet for this task. Measure the flours, baking soda and salt in a medium size bowl; stir it together and set it aside. In a large bowl, beat the peanut butter, margarine and sugars with an electric mixer until well combined. Add the Ener-G mixture and vanilla extract and beat it well again. Add the dry ingredients to the butter mixture and stir by hand to incorporate it into the dough. Alternatively you can use the electric mixer at low speed to do this. Since I have used whole wheat pastry flour I did it by hand itself because I did not want it develop too much gluten. This cookie dough is dry and crumbly unlike the usual cookie doughs. You will have to use your hands to mix it well. About halfway through mixing, add the chocolate chips and stir until just blended. 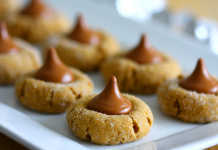 The way the dough ends up depends upon the type of peanut butter used. So do as I did. Test bake 2 cookies and decide what you have to do. Shape the dough into balls and place at least an inch apart on an ungreased cookie sheet. Flatten each one a little with the palm of your hand, so they’re more like little patties. I pinched small pieces of dough and rolled between my palms; dampened my fingers with little water to enable easy flattening. The patties were not smooth but had a couple of cracks. That’s fine. Bake it for about 11-12 minutes, until just set. I baked the first 2 cookies for 12 minutes and saw that the bottom had started turning dark brown. Other than that I did not face any other problem with the dough being crumbly. So proceeded with the rest of the dough too in the same manner but baked it for just 11 minutes. Remove the baking sheet from the oven and cool it on a wire rack for 5 minutes so it will continue to bake and will set completely. After 5 minutes transfer the cookies to the wiring rack directly and let it cool. The cookies do not have a smooth finish but have some cracks around the edges. Almond butter was used in the original recipe. 1 and 1/2 cups of all purpose flour was only mentioned in the recipe. I wanted to use some of the left over whole wheat pastry flour and cake flour so I have used a combination of both. I read in a book about substituting cake flour for all purpose flour. I noticed that 1/4 cup of extra cake flour was substituted to replace the all purpose flour. So I used 1 and 1/4 cups cake flour to substitute for the 1 cup of all purpose flour. To make it clear if you are using just all purpose flour use only 1 and 1/2 cups. I used a dull aluminum baking sheet for baking the cookies. If you are using a dark coated non stick cookie sheet be alert for quick browning of the bottom of the cookies. So test bake and see. If you think it browns quickly and doesn’t bake properly, you would have to reduce the oven temperature a little bit. Use crunchy peanut butter or add chopped peanuts or any other nuts for added taste. I love your recipes. New to baking.. But have a great success with all those I have tried from your recipes – brownies, cakes, etc. love this site. Can i use silken tofu here? Thanks for the feedback. Silken tofu will make the cookies very soft and chewy.